Chef Mok Kit Keung joined Kowloon Shangri-La, Hong Kong as Executive Chinese Chef of the Michelin-starred Shang Palace Chinese Restaurant in May 2011. Chef Mok oversees an experienced team of Chinese chefs, many of whom have been working at Shang Palace for 10 to 20 years, and he is responsible for all Chinese food production at the hotel. Prior to his current position at Kowloon Shangri-La, Hong Kong, Chef Mok served as chef de cuisine of Marina Bay Sands, Singapore. Chef Mok was trained in traditional Cantonese cuisine at a young age and has over 35 years of culinary experience. 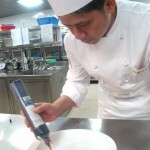 After being promoted to executive chef in a local restaurant, he decided to relocate to Singapore, where he spent almost two decades working at a number of prestigious establishments, international luxury hotels and convention centres, such as Raffles Hotel Singapore and Suntech Singapore International Convention and Exhibition Centre. Later, he went to work at the Marina Bay Sands, Singapore, as chef de cuisine, heading the kitchens of four Chinese restaurants with more than 75 chefs, before returning to Hong Kong two years ago. 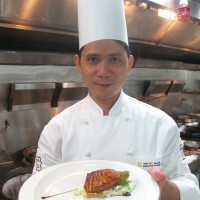 Having prepared meals for King Mohammed VI of Morocco, the President of Russia, the former and current Prime Ministers of Singapore and many other prominent dignitaries and celebrities from around the globe, Chef Mok joins the Kowloon Shangri-La, Hong Kong family with distinctive gastronomic mastery. He has received a number of culinary accolades, including the Gold Medal Award in Chinese Cuisine by the Restaurant Association of Singapore in 2001 and 2004, and the Gold Medal Award in the Food Hotel Asia 2008 Imperial Challenge, and numerous other recognitions over the years. 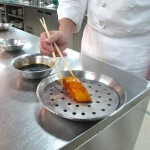 In July 2012, Chef Mok was invited by Shangri-La’s Far Eastern Plaza Hotel, Taipei as guest chef and concocted special menus to pamper the palates of epicureans. He also conducted a cooking class which was well received by the locals. Inspired by the unique style of Singaporean culinary culture, Chef Mok infuses an artistic and modern touch to the presentation of his dishes, which brings the dining experience to a new height. His signature dishes include Braised Bird’s Nest with Pumpkin Cream in Japanese Style, Braised Spare Rib in Chin Kiang Vinegar with Cabbage, and Oven Baked Cod Fillet with Egg White and Conpoy (dried scallop). Chef Mok was invited to cook for the 2012 Melbourne Food and Wine Festival as part of The Crown Melbourne‘s “Stars of Stars” program. Held in March of 2012, the event saw a constellation of European and Asian Michelin-starred chefs—eight in total. He was also invited as guest chef by sister hotels in Taipei in 2012, Singapore in November 2013, and Paris in March 2014. He was invited by Hong Kong Tourism Board to sit on the panel of judges for the 2012 Best of the Best Culinary Awards. “To maintain Shang Palace’s traditions and at the same time bring in new elements, we need a world-class executive chef to work together with a team of professional Chinese chefs to continue the success of this Michelin-starred outlet. 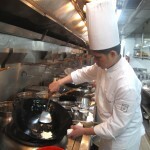 We are happy to have Chef Mok at the helm of Shang Palace kitchen. With his significant experience in designing creative and innovative menus, Chef Mok is a strong head chef who can bring an unparalleled focus on menu design, overall food quality and presentation,” said Mr Timothy Wright, General Manager of the hotel. Chef Mok is happy to share his recipe for one of his signature dishes and Oven Baked Cod Fillet with Egg White and Conpoy with the readers of Connoisseur. Enjoy! 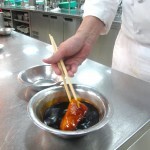 Marinate the cod fillet with light and dark soy sauce. Place the cod fillet on a stainless steel tray with holes. 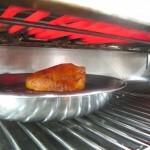 Bake it under the salamander for 8 minutes at 220-250 degrees until light brown. While the cod fillet is baking, heat oil in a wok, add in egg white, stir fry until cooked, take out the egg white, drain the excess oil and rinse the wok with lukewarm water for a few seconds to make it less oily. Remove the water. Heat chicken broth in wok, add in steamed conpoy and sliced asparagus, season with salt and chicken powder, thicken with corn starch, and add in the cooked egg white. Take out the cod fillet from the salamander and glaze it with honey, put it on a paper kitchen towel to absorb excess oil. 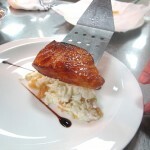 On the plate, draw a ‘V’ with crema di balsamico, plate the egg white in the middle, and put the cod fillet on top. Garnish with Swiss parsley.